I've had my SSD for almost two years now and although Intel's SSD utility shows it as having plenty of life remaining, I'd been reading up on TRIM and the details of how SSDs manage their space. TRIM is a kind of garbage collection for SSDs, for although SSDs don't experience data fragmentation of the sort that hard drives do, there is clutter which can accumulate over time and negatively affect performance. I found a forum post on "refreshing" SSD performance which mentioned a tiny utility called ForceTrim, which tells your SSD to perform TRIM processing and smooth out the "wrinkles" in its data storage. 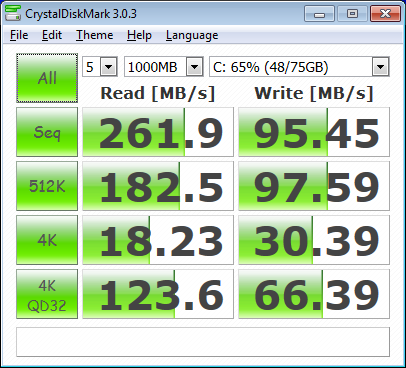 BEFORE - Seems pretty close to new SSD performance. AFTER - Modest gains pretty much across the board. It does appear that manually invoking TRIM can provide a modest boost in read and write performance for an SSD. 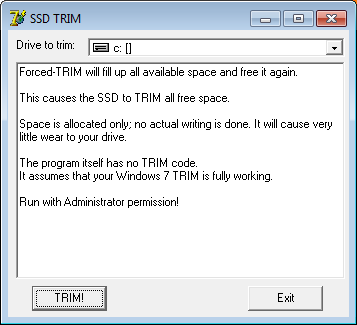 Perhaps in the SSD age, forcing TRIM once in a while is the "new" defrag?